Philosopher: A philosopher is a person with an extensive knowledge of philosophy who uses this knowledge in their work, typically to solve philosophical problems. Philosophy is concerned with studying the subject matter of fields such as aesthetics, ethics, epistemology, logic, metaphysics, as well as social philosophy and political philosophy. Recently my instincts have been at the forefront of my everyday life, and they were recently challenged by someone, who implied that parents cannot survive on instinct alone. Trusting your instincts is hard, but is something I am so passionate about. So today, I thought I’d share with you how mine have helped me, and my family recently. They have helped my four year old son, who has coughed for as long as I can remember; dismissed as asthma by the doctors my instincts told me it was something more, something digestive and sure enough it turns out that it looks like it is something more.We don’t know what yet, possibly Coeliacs, and blood tests and x-rays await us at a hospital appointment. I’m not one for visiting the doctor unnecessarily, but in this case my instincts kept me going back to ask for help….and I was right to listen to them. My one year old has also been testing my instincts recently too. He’s never slept through the night (three chest infections in three months haven’t helped) and when you tell people he still has a feed in the night they are horrified, and pretty much always suggest training him out of it. But my instincts tell me he needs it. That it is not for comfort. That it is a full feed. It’s often sleep and feeding issues that can test a mother’s instinct (no one likes sleep deprivation!) and this may be when some might reach for those books to look for suggestions about how to make your baby ‘sleep through.’ Stories of how babies slept for twelve hours a night from ten weeks and how they eat more than you do don’t help, and can make you feel like you are doing something wrong. But, much as I’d like a full eight hours of sleep, as you all know I read my baby, and right now, he’s telling me he needs that feed. So that feed he will have. My instincts have also been there recently about me. About how I am with my PND. The tablets may be gone, and I’m so much better than I was, but it’s still there. It still lingers on. Most days are amazing and I’m happier than I have ever been, but sometimes things can upset and distress me more than they should. And I need to listen to my instincts about how I am feeling, trust them, and ask for help and support on the days where I’m not in control of my brain. On the days where my brain tells me disaster is imminent and I am worthless and cannot cope. I know it can be heard to listen to what your gut is telling you, and to have the confidence and trust to go with it. So much advice is conflicting; co-sleep/don’t co-sleep; form a strict routine/be baby-led…it’s endless and it can be overwhelming, making it hard to know where to start. And whilst you all know I think advice is invaluable and sounding out ideas is fantastic, it’s far better from and with trusted sources. Many mums worry when their children don’t do things ‘by the book’ or how have been made to believe they ‘should’ do things, but if you listen carefully and look at your baby you’ll know if what’s happening is ok and meant to be…or not. Each baby different. Each situation different. Each instinct different. Listen. Totally agree! As I wrote last month on my blog, you have to do what’s right for you. There’s so much informaiton out there but people shouldn’t feel forced to adhere to it. We know our babies like no-one else does. 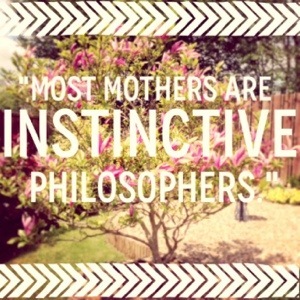 I never used to believe in ‘instinct’ but you know, I knew I was pregnant before I did the test, and from that point onwards my instinct has helped me towards motherhood, and now I am a Mum too. There is something to be said for our own minds! Good for you! Mums know their own children best of all (and there are plenty of other kids still having a feed in the night at a year anyway). Brilliant post! Ignore the ‘stories’ and make your own. I love the idea of reading your own baby – much better than any parenting book! Oh yes, so much better lol! Great post and great quote too. Only you know your baby. That goes for most mothers.